Some people say meerkats are cute. I don’t agree. Philip and I were fortunate to photograph the meerkats of the Animal Planet series Meerkat Manor. The brief was to photograph the characters of the series in a way that would show their personalities and fit in with the intimate style of the television show. Little did I know then how much I would dislike meerkats two weeks later. The meerkat communities they used for the show were the subjects of a long-running meerkat research project. On the farm where the research was done, many students spent time with these adorable creatures, following their every move and recording their behaviour and habits. Because of the constant proximity of people, the meerkats became habituated to their presence. They didn’t regard people as dogs would see their masters, but rather as objects that were always around. To photograph meerkats there is a photographer’s dream come true. I could get right up to them and almost touch them with my lens, and they would ignore me completely. So to get dramatic intimate images, we used the 16-35mm wide-angle lens constantly. We lay down between them and photographed them from their own perspective. By doing this we could show the environment and also the detail of their fur in the same image. 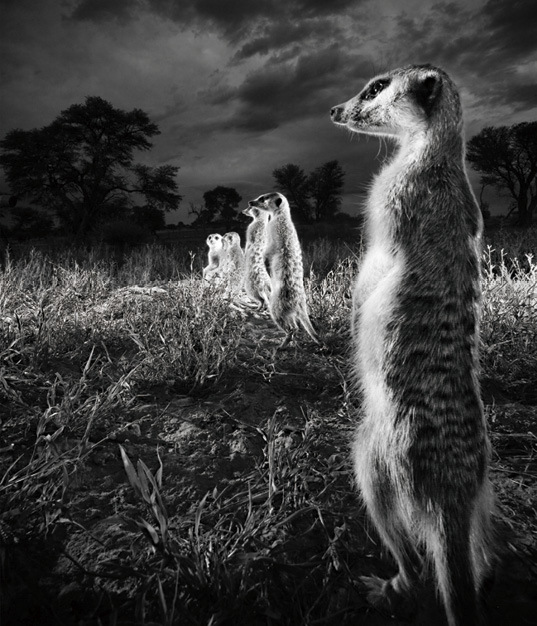 We used various flashes from the side to light the meerkats and this helped to bring out the textures. We underexposed the background and used the flashes as the main source of light for the image, which helped to make the images more dramatic. Meerkats are very human and we found ourselves laughing at their antics. During one of the shoots a meerkat got up on my back and perched on my head, looking out for predators. The meerkat saw me simply as a convenient lookout perch from where it could scan the surrounding area. While this meerkat was standing on my head, I started to feel all kinds of insects climbing down from the meerkat onto me. I had to keep still for a while for Philip to get an image, and I didn’t want to be rude to the meerkat and throw him off. But after a while I couldn’t take the insects any longer and forced him to get down (to his marked irritation). We finished the shoot and went home with cards full of meerkat images and memories that cannot be bought. Fast forward two weeks: I noticed a tick bite on the tip of my nose. The tiny pepper-tick must have come from the meerkat and found its way to my nose where it attached itself. One miserable night I developed a vicious fever, which turned out to be tick-bite fever. Suddenly the memories of the cute little meerkats were ruined for good. In a pool of sweat and fever in the middle of the night, I cursed them and punched the sky – Meerkats are not cute at all.